Access to the weird and wonderful world of cyberspace is a must when you're travelling through strange and surprising countries. And one of Poland great attractions is that it's a treasure trove of the unusual and the peculiar. No wonder film director David Lynch fell in love with the country - now he's even set up a film studio in fair old Polska. If you're keen to dispatch your friends news of the strange customs of eating lard, the delights of Polish film-dubbing or the glorious cult of the moustache, then you'll need to make a beeline for these internet dens. 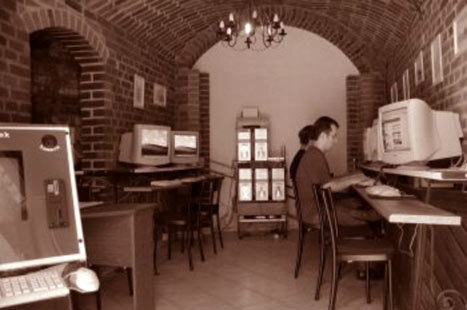 Gdansk has an ever-expanding range of internet cafes, likewise Sopot and Gdynia. Here we've selected a few to get you started, and please let us know if you find any hidden gems! The 'Internet Cafe' is the place to go for all your computing needs. Located right across the street from the train station, its an easy stopping point on your way to the Old Town. After sitting down with a free cup of tea or coffee at one of their 30 sweet machines, you'll be sure to note the super fast connection speed and vast array of extras at your disposal. For a few extra zloty you can burn CDs and DVDs, print documents, or upgrade to the VIP room. The Internet Cafe is also the place to go for all your gaming needs, from first person shooters like 'Counter Strike' to racing madness with 'Need For Speed: Underground.' They even have a PS2 and an X Box, if you're looking to get in a little 'Grand Theft Auto.' If you're just stopping in to check your email, 10 minutes costs a meager 1 pln, but if you're ready to park yourself in front of a screen for the afternoon, no need to fear! the prices are excellent and the longer you stay, the better the deal. Keep an eye out for promotions and discounts and relax, knowing that you've found the best internet cafe in Gdansk. Spacja is located in an immaculately restored cellar. Besides surfing the net, you can print documents, scan images and burn CDs. This central option is part of a full-on funhouse complex. Besides an internet cafe you'll find a billiards room, a restaurant and, in the evenings, a nightclub. First floor internet cafe on the fringes. A handy pit-stop for diving into cyberspace. Cybertronic option on the street of the popular King Wladyslaw IV. Popular Gdynia option on Orlowska. Log on at 4 zl per hour - discounts for students! I was in Trojmiasto several times and might compare its Internet Cafes to other cities in Europe. Gdansk is First Class! Young Service and v. good printing with fair pricing. My US Capital City had some Cafes at PC Services but right now almost all Cafeterias have their own WiFi spots. Public Libraries have stations with free 15 min access. Visit Gdansk. Enjoy its Beautiful Atmosphere, and maybe Polish Food. I have a question: how mutch does it cost for 15 à 30 minutes?